Why, asks an otherwise satisfied reader, is there so much dumb libertarian stuff in “Dogging Steinbeck”? Bill Emerson of Kansas City read my book and liked it enough to give it four stars, for which I am grateful. But he couldn’t understand why I had put so much of my libertarian politics in the book. Here’s his comment from Amazon.com, followed by my explanation/response. 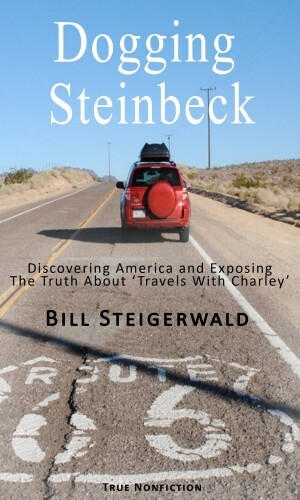 I had read several Steinbeck books, but not Charley. What in the hell does Libertarian have to do with it? president, then it mushrooms to most of the Republican party….. Thanks for the nice comments. 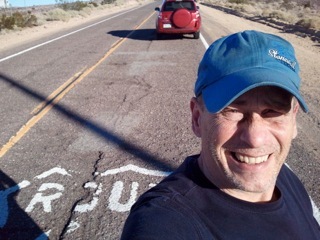 As I write somewhere in the book, when you drive the miles and write a road book about America you — the author — get to air/spew your political opinions about what you see and think. Steinbeck did, though most of his (liberal Democrat) comments were taken out of his original manuscript. Bill Barich did in “Long Way Home.” Philip Caputo just did in “The Longest Road.” Heat-Moon did.Everyone does. Sprawl, commercial development, cars, the environment, energy policy, city planning, race relations, the ups and downs of the economy — they’re all driven by politics (unfortunately) and open to debate. Most travel books are written by liberal Democrats who, as I point out in the book, all sound like they’re reading from the editorial page of the NY Times. They hate sprawl, they hate malls, they make fun of free markets, they unthinkingly embrace government regulation, they hate the culture and the conservative politics of Flyover Country — and they say so in their books. Most reviewers don’t even notice or mention the authors’ left-liberal-East Coast politics, mainly because the reviewers invariably are liberals too. I’ve been an open libertarian journalist/columnist/media critic for 30-plus years. For me to pretend not to disagree with Steinbeck’s political point of view or the liberal Democrat point of view of Barich et al., or to let their political commentaries or biased asides about America or its people pass without comment, would have been dishonest and phony, not to mention foolish. Road books are about the road, the country, the people you meet, etc., but they’re all filtered through the author — his life, his thoughts, his politics. Not everyone is a Republican or a Democrat, thank god. The two major parties have brought us a national government that is a Big Nanny/Big Snoop at home and World Cop overseas. It’s pretty sad that my libertarian politics — that peaceful people should be as personally, economically and socially free as possible; that government should be as decentralized and weak and unnoticed in our daily lives as possible; and that America should mind its business overseas — would seem exotic or out of place to a fellow America today. Those basic libertarian principles have been forgotten and abused. But they would be very familiar — and very dear — to Jefferson or Washington or Grover Cleveland or Twain or Mencken or Milton Friedman or hundreds of other dead great Americans whose politics were essentially libertarian.